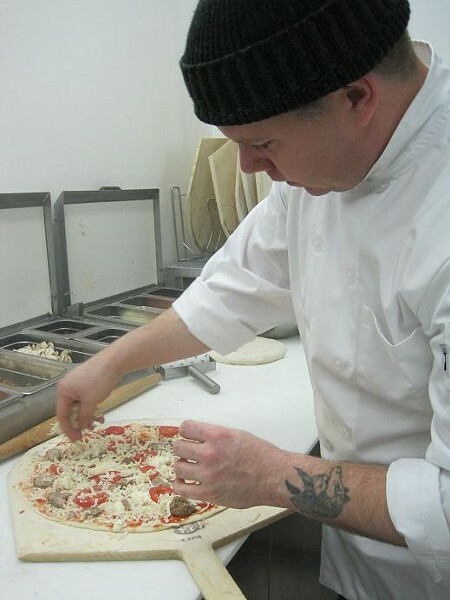 "Here is a little recipe very similar to the way I make pizza in the shop and at home," says Jon Feraro of Feraro's Jersey Style Pizza, who was profiled in yesterday's Chef's Choice. 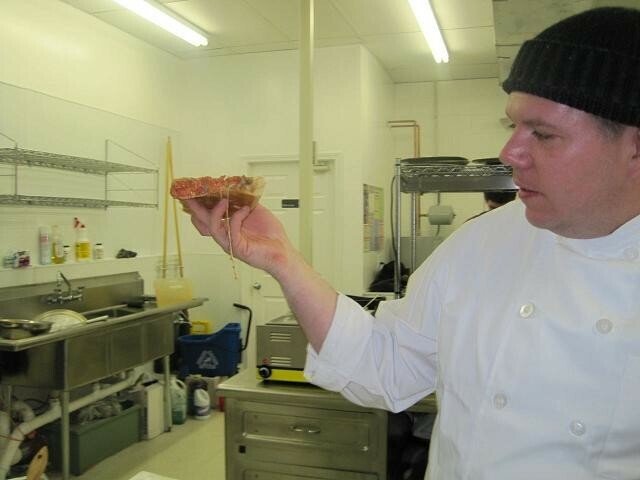 "If you follow these steps, you can impress your friends and family with fresh Jersey-style pizza at home!" 1. Turn your mixer on the lowest setting. Pour water into bowl. 2. Add flour to one side of bowl. Add salt and oil to water side of bowl. Add yeast onto flour to introduce slowly into mix. Continue on low. Mix until all ingredients form a single ball of dough, adding water, 1 teaspoon at a time, if it is too dry. 3. Let dough rest for 5 minutes and then form dough into a tight ball, making sure there are no air pockets, gaps or tears. Coat dough ball in olive oil and place in an oiled bowl. Cover with plastic wrap and let sit for 1 hour at room temp. 4. Preheat oven as high as it will go. 550 degrees is ideal. If you are using a stone, heat it for an hour while the dough rises. 5. Take the dough ball to a flat, smooth and flour-dusted surface. Evenly coat dough ball in flour and roll out dough ball into a pizza round. Says Feraro: "You can impress your friends by stretching it further and twirling and throwing it over your head. Although this may take a little practice. You'll see how easy we make it look at Feraro's." 6. Place the finished pizza round onto a sheet pan. Add sauce, cheese and whatever toppings you want. Place pan in oven and bake for 4-5 minutes or until the dough is half baked and starts to brown. Cheese should be bubbling and starting to get brown spots. Pop any bubbles that get too large with your "bubble popper". 7. If using a stone, slide the pizza very carefully onto stone to finish for a couple of minutes, or until the whole pie is a deep golden brown. Delizioso! Robin Wheeler writes the blog Poppy Mom and is a regular contributor to Gut Check, including the columns The Dive Bomber and Throwback of the House.